Ruxolitinib sulfate is the first potent, selective JAK1/2 inhibitor to enter the clinic with IC50s of 3.3 nM/2.8 nM, and has > 130-fold selectivity for JAK1/2 versus JAK3. 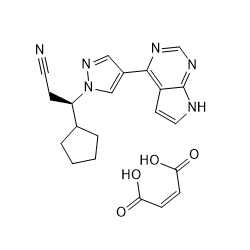 CEP-33779 is a novel, selective, and orally bioavailable inhibitor of JAK2 with an IC50 of 1.8±0.6 nM. 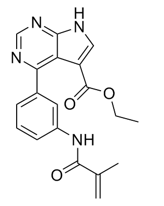 Oclacitinib maleate is a novel JAK inhibitor. Oclacitinib is most potent at inhibiting JAK1 (IC50=10 nM).